This excellent book is written by Giles Eyre, an experienced barrister and Lynden Alexander, a communication skills consultant. The book is well laid out; the topics are covered in a logical and easy to follow sequence. As you might expect, the earlier chapters look at the essential qualities of a medical expert and then move on to deal with opinion evidence both in general terms and more specifically in complex claims. 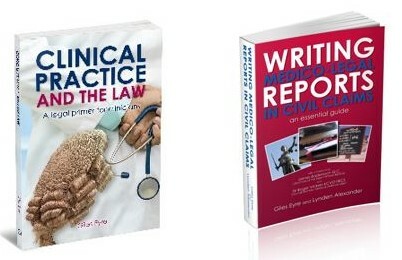 There are specific chapters on reporting in clinical negligence claims as well as addressing practical concerns in the expert witnesses practice with sections on cost budgeting and maintaining the integrity of an expert witness practice. This is book is in its second edition. It includes updates on recent case law including the Jackson Reforms and more recently the Montgomery ruling on consent and is recommended to lawyers and medical experts alike. For newly appointed orthopaedic consultants trying to break into the medico-legal marketplace there is precious little guidance on the actual process of litigation or how to write medical reports and how to present expert evidence. This book provides a good introductory background for the newly appointed consultant and is a good reference source for more experienced practitioners. It explains how the medico-legal mind-set is rather different from the conventional clinical mind-set. In clinical practice we are used to accepting what the patient tells us. In medico-legal practice we have to adopt a more forensic approach to the account given by the claimant. The book covers the legal background to claims including an update on recent changes in the law. It contains an extensive section on the roles and duties of an expert witness which is essential reading particularly for those new to medico-legal practice. There is a clear explanation of the differences in requirements for personal injury reports versus medical negligence reports. There are guidelines on report writing, including suggested templates for both personal injury and negligence. In the section on negligence, the importance of not analysing the case with the benefit of the retrospectoscope is emphasised, which in the reviewer’s experience, is an all too common failing of some experts. Overall I believe that his is an essential addition to the bookshelf of any orthopaedic surgeon who is carrying out medico-legal work. It will serve both as an introductory guide and a reference source. This is the second edition of an essential guide with its self-explanatory title – and ‘essential’ is exactly what it is. It is the handy paperback volume that most or indeed all lawyers would advise expert witnesses to read, as well as inwardly digest. ‘No medical expert witness should be without it,’ says leading EWI member James Badenoch QC writing in the Foreword. ‘The text provides a comprehensive update of the relevant law and procedure,’ he adds, ‘with a clear exposition of the many changes to the Civil Justice System over the last four years’. He goes on to note that opinion evidence must meet legal requirements so that it fulfills its proper function in the litigation process. The fact that most evidence in courts of law now has to be presented in written form makes this useful book all the more necessary to acquire for expert witnesses. Taking a practical and plain English approach illustrated with examples throughout, it explains with commendable precision, what to do and — perhaps more importantly — what not to do, across a vast range of possible circumstances. For example, in the chapter on opinion evidence, (and this is only one example) a clear distinction is drawn between ‘signs’ and ‘symptoms’. (Yes, the difference is important.) As a follow-on concrete examples are given of helpful written opinions and unhelpful written opinions. As you would expect, the book contains any amount of new material, reflecting the changes that have taken place in the civil justice system over the last twenty-four months, so you do need this new edition in order to remain up to date. For instance, there is new guidance for the Instruction of Experts in Civil Claims 2014… the full updates of the Civil Procedure Rules 1998 and Protocols and an explanation of the effect of the Jackson Reforms. Recent case law relating to causation, acceleration of symptoms and prognosis is also of course, included, plus other important developments. You can use this guide either as an introduction to medico-legal and quantum reporting in civil claims, or as a ready and erudite reference to the more technical issues that inevitably arise. In this challenging and often complex area where subtle differences in wording can conceivably alter the outcome of a case, this book can be depended upon to help the expert witness avoid the ambiguities and pitfalls that can occur in the presentation of written evidence. As has already been stressed, no expert witness should be without it. The claim is for damages for a medical mishap or a road or industrial accident. The experts will play a pivotal role and writing the report and joining in the joint report, following the joint meeting of experts may have a decisive influence upon the outcome. The relationship between the lawyers, solicitor, barrister, and judge, with the experts will often be the key to the successful progress of the case and the correct result. Science seeks the truth, while the law does justice (page 151). The first phrase may well be true, the second phrase may be a little more contentious. In a full, comprehensive, authoritative, and readable book the authors cover every imaginable point that could possibly arise. The rules and practice direction and guidance are discussed. The pitfalls lying in wait for the medical expert are clearly set out. Practicality shines through as the constant theme. The expert must be careful with the concept of causation, so beloved by the lawyers. What are the material considerations? What are the contributory factors? How should the expert approach contributory negligence? How to explain prognosis and life expectancy? How to explain the investigation and the analysis? How to avoid pronouncing on the ‘ultimate issue’, which is the exclusive prerogative of the judge? How to avoid subconscious bias? Today there are many pressures falling upon the medical expert, and many changes are taking place – all lucidly discussed in this study. Intermediaries have become common through the medical reporting organisations and MedCo, raising new issues in the relationship between solicitors and experts, and solicitors and intermediaries. The pre-action protocols must be followed. The abuse of whiplash claims has been curbed. What should the expert do if he changes his mind? Does this mean that he has been careless and revealed to be incompetent? Or does this mean that he is a thoughtful flexible fair-minded expert worthy of high respect? Solicitors are increasingly asking for an early screening or advisory report, thereby putting the experts at risk of the trap of a premature opinion. Concurrent evidence, both experts giving their evidence together, may be expected to become more common, following the report of the Civil Justice Council 2016, a process calling for new skills on the part of the experts as the process is less adversarial and more ‘conversational‘, and calling for more international skills. In an age of austerity fees and costs are sensitive matters. The government, following the Jackson report, is keen to regulate and control recoverable fees for the experts and recoverable costs in litigation. The experts are finding that they cannot give sufficient time and attention to the work, the quality is accordingly at risk as the allowed levels of fees are becoming uneconomic. The authors know their subject and expound their subject very systematically. In this essential book they explore all situations. They give practical courses under the aegis of the Expert Witness Institute. Virtually all the reported cases are fully discussed, though Pora v The Queen  UKPC 9, the proper role of the psychologist, is missing (though perhaps was available only after going to press). The conscientious solicitor and the conscientious expert who engage in civil medical cases would be foolish not to have this impressive book to hand, and to benefit from its scholarship and practicality.